Mix the pesto with the breadcrumbs, add a drizzle of extra virgin olive oil if necessary. Season the filets with salt and divide the pesto mixture into 4 parts. Top each filet with the pesto mixture and set aside. 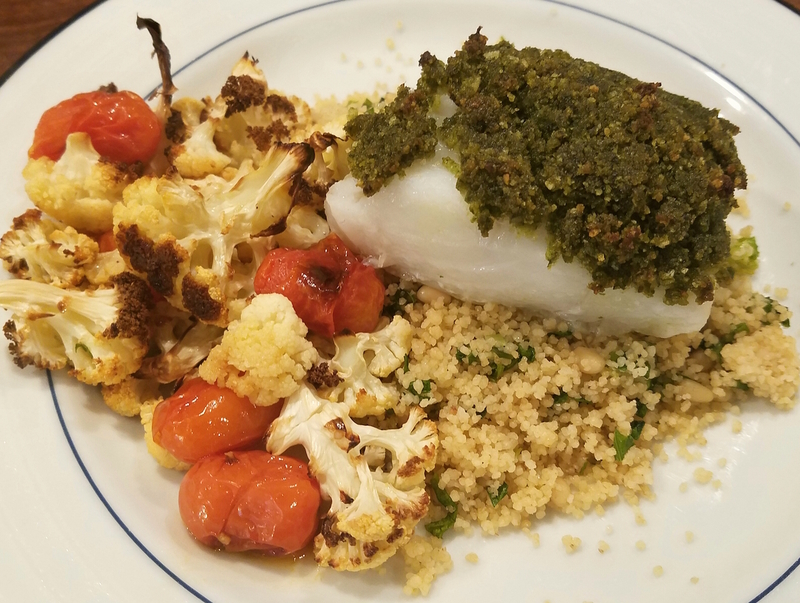 Place on a lined baking sheet and bake in oven for about 10 minutes or till the pesto mixture is golden brown and the fish is cooked through. Baking time will vary according to the filet thickness. 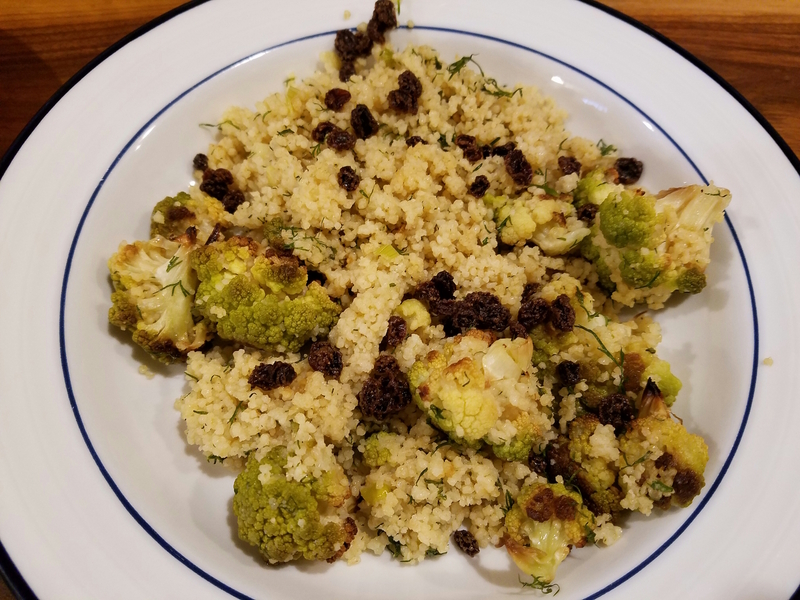 Take out and serve with roasted cauliflower and couscous. Place the florets and tomatoes onto a lined baking sheet. Drizzle with olive oil and sprinkle with salt and pepper. Mix well and roast for about half an hour or till the cauliflower is golden brown. Serve with the fish. The roast chicken from yesterday was served on this yummy concoction..
Heat the oil in a small pan and add the broth and salt. Bring to boil, add the couscous, cover with lid and turn the heat off. Let it sit for 10 minutes, take lid off and fluff with a fork. Keep aside. Place the florets on a lined baking sheet. Drizzle with oil and sprinkle with salt. Mix well and roast in a 400 degrees oven for 30 minutes. Take out and keep aside. Heat a large frying pan with the olive oil. Add the green onions and garlic and sauté for 3 to 4 minutes on medium heat. Add the currants, roasted cauliflower and cooked couscous. Saute for 2 to 3 minutes until everything is incorporated and heated through. Check for seasonings and add salt if necessary. Garnish with dill and serve. I am obsessed with Asian style bowls- it’s a great way to serve a dish with all sorts of flavors and textures- this one is a vegetarian one and Mediterranean inspired.. perfect for Meatless Monday! Best of all- it used cauliflower rice!!! Heat a saucepan with the butter and oil. Add the rice and sauté on medium heat for 2 to 3 minutes. Add the broth and bring to a boil. Simmer on low heat with lid on for 30 minutes or until the rice is cooked through. Take the lid off and let cool. In a large frying pan add the oil, onion, garlic, pine nuts and dill stems. Saute on medium heat for 2 to 3 minutes. Add the corn and the cauliflower. Saute on medium heat for 4 to 5 minutes. Add the cooled rice, dill and parsley. Saute for another 4 to 5 minutes, add salt but not too much as feta will be added later. Let the mixture cool and add the crumbled feta. Heat a small saucepan with the oil. Add the garlic and sauté on medium heat for a minute. Add the sauce, dill, lemon juice and salt. Cook for about 10 to 15 minutes. 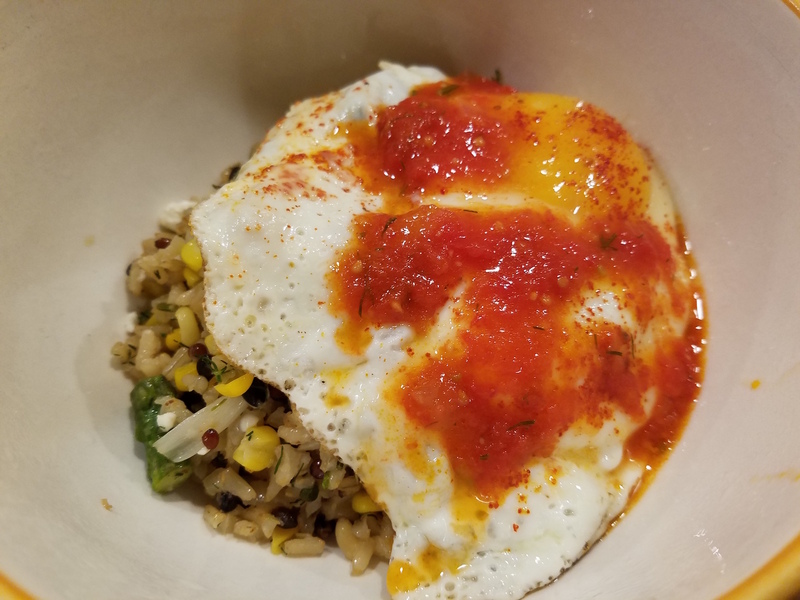 Serve over the rice with a fried egg on top!